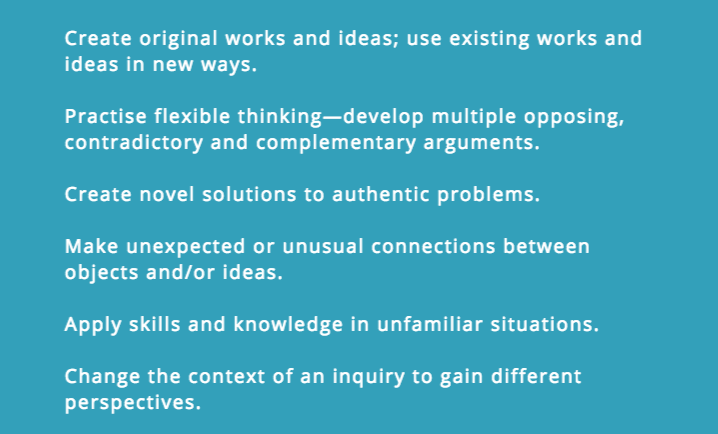 Suggestion: print this document and paste into your process journal to provide a constant reminder of these skills. 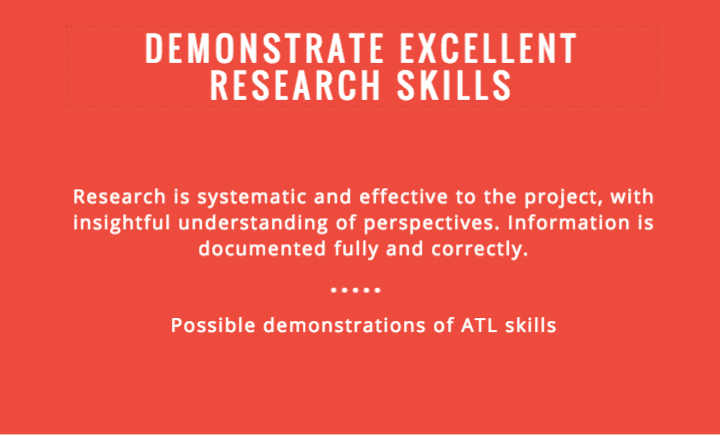 You need to provide evidence that you used these skills throughout the project. 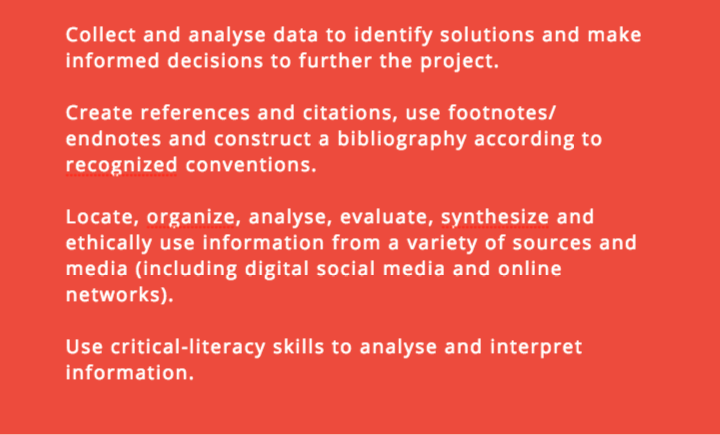 Include the extracts, in your report, from your journal that provide evidence of these skills. EXPLAIN in detail how that ATL was used in during your CP Process! Select parts of your process journal that demonstrate your self-management skills, such as timelines, schedules, goal setting lists and organizers, to add as appendices to your report. 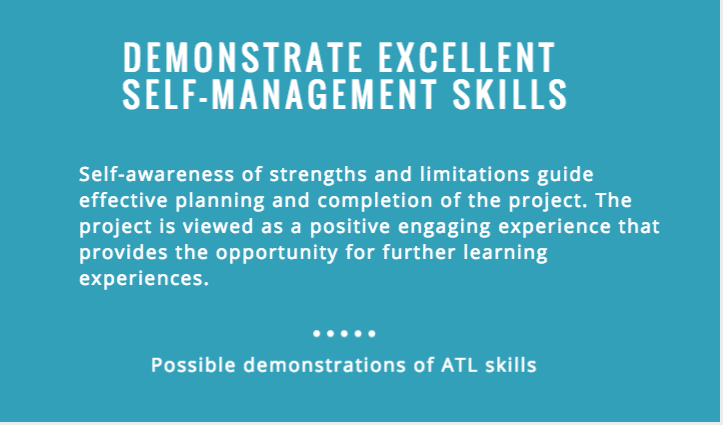 Refer to these appendices when you discuss your self-management skills. what did I learn about today? what don’t I yet understand? what can I do already? what will I work on next? what can I do to become a more efficient and effective learner? 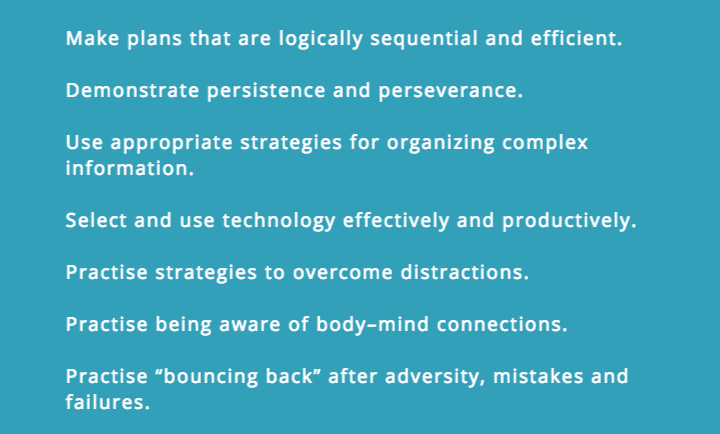 what factors are important for helping me learn well? Then in your Journal, reflect on the specific frustrations! Specifically reflecting on WHY you chose this article, what it helps you with, what it doesn't tell you that you still need to know. Use this to start you reflecting on your sources. Select parts of your process journal that demonstrate your thinking skills, such as brainstorms, mind maps, evidence of critical thinking, to add as appendices to your report. 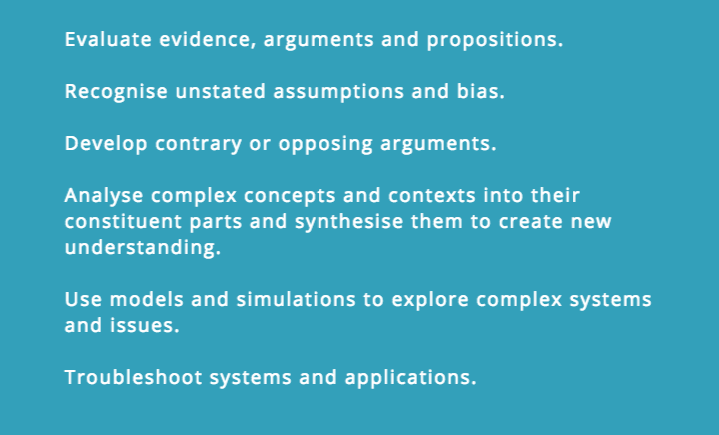 Refer to these appendices when you discuss your thinking skills. Select parts of your process journal that demonstrate these skills, such as how you responded to feedback, how you communicated with others and how you interacted with people, to add as appendices to your report. 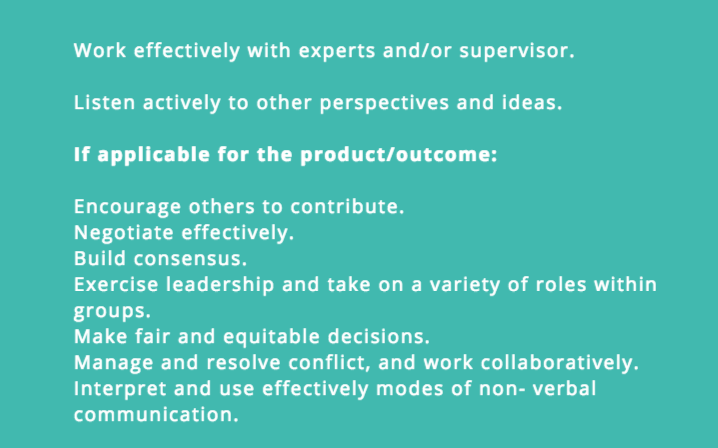 Refer to these appendices when you discuss your social and communication skills. Excellent ability to communicate with a wide range of people in an appropriate manner. Excellent ability to express themselves fully and fluently with a range of media including written, oral, and visual communication. 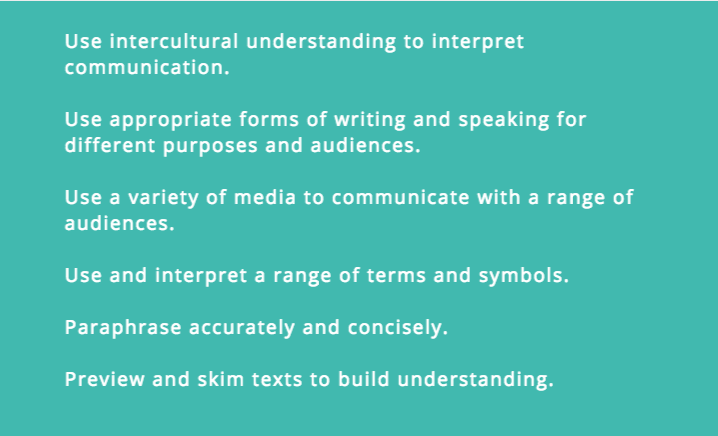 Uses discipline and/or text specific forms of expression for different purposes and audiences. 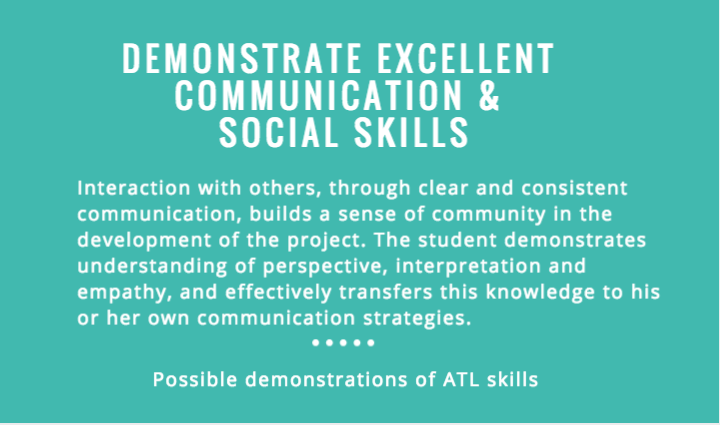 Excellent ability to explain the purpose of their project and articulate their learning.